How to open an account on Bet9ja? The first step towards claiming the Bet9ja welcome bonus and live the sports betting experience the operator provides is to open an account on Bet9ja. This guide will help you go through the sign-up process successfully while also sharing important details to get started on the right foot! From how to open an account on Bet9ja and place a bet to accessing the mobile platforms and making deposits and withdraws, this review has it all for a great start. Click on “Register” – A small yellow button on the top right-hand corner of the operator’s official platform. Fill out the registration form with the necessary information. Surprisingly, your email is the only thing required at this point. You will notice that there is a second field that asks you to enter a promo code if you have one. More than often, operators, Bet9ja included, offer bonus codes to boost players’ experience and, sometimes, claim the various bonuses by activating them (the codes). To find out more about Bet9ja offers and promotions and see if a promo code is available, visit this page. You will receive a confirmation email. Follow the directions provided to complete the registration process. You can now make your first deposit and qualify for the 100% welcome offer. Now that you have figured out how to open an account on Bet9ja, you can move on to other, admittedly, more interesting activities, such as claiming the Bet9ja welcome bonus! The main welcome offer that every new customer receives after they open an account on Bet9ja is a 100% bonus up to ₦100,000. To unlock it, you need to make a deposit of, at least, ₦100 and then stake the entire deposit sum on sports bets (single or multiple bets) with odds 3.00 and higher each (T&Cs apply). Visit Bet9ja’s mobile app page: https://promo.Bet9ja.com/mobileapps/. Initiate the download of the sportsbook app. Alternatively, you can access the Bet9ja mobile website from your mobile device’s browser, tap on “Register” and follow the same sign-up process as with the desktop version. Only players over 18 years of age can register with the operator. The betting service only accepts NGN (Nigerian Naira). In the event of a major win (over NGN 1 million), Bet9ja may request specific information from its customers, such as the town of residence for its own promotional purposes or publicity. Failing to provide the materials mentioned above can suspend the player’s Bet9ja account. After you open an account on Bet9ja, the next step is to place your first bets. Two of the most common types among new Bet9ja players are the single and combined bet. A single bet is, as its name suggests, a bet on a single event. As soon as you open an account on Bet9ja, head to the left-hand column and choose a sport and then a tournament. Select the game/match you wish to bet on and finally the preferred odds. Lastly, insert the desired bet sum and hit “Continue” and “OK”. Done! A combined bet is a wager that includes several outcomes from different sports markets. Follow the same road as before (with the single bet); only, this time, add more selections from a wider range of Bet9ja sports. If you need to deposit funds after you open an account on Bet9ja, you will find several payment options to make deposits, which include ATM, Quickteller, Debit card (Webpay), Instant Bank Transfers, and the Providus Bank Collect Pro App deposits. As for Bet9ja withdrawals, the only method available is Bank Transfer. 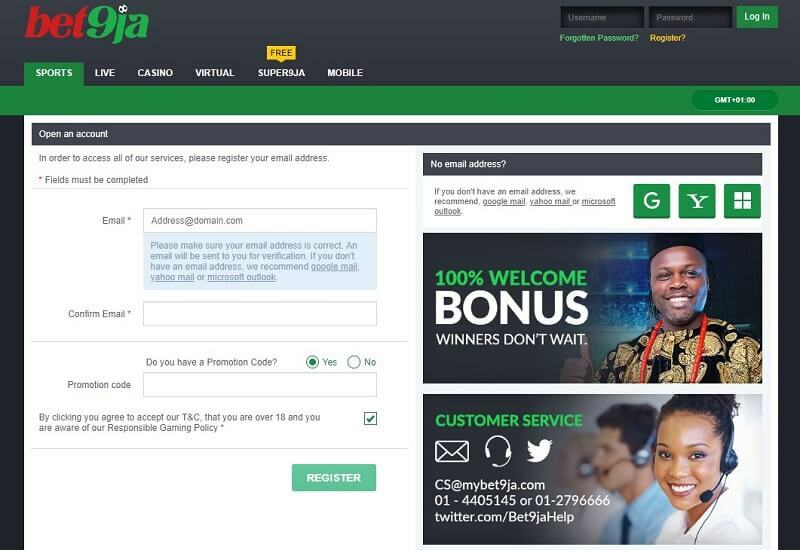 If you have any questions about how to open an account on Bet9ja or any other activity with Bet9ja, you can contact the customer service department either via email (response time around 24 hours), telephone (between 8am and 9pm) and traditional mail. Alternatively, you can get in touch with the operator’s Twitter customer service and leave your query there. In this case, note that the required time to receive a reply is not clear.